And it came to pass that yet again the powers that be decreed that the AMM were sufficiently “celtic”, (in the modern-day local governance interpretation of the word) to celebrate this culture. 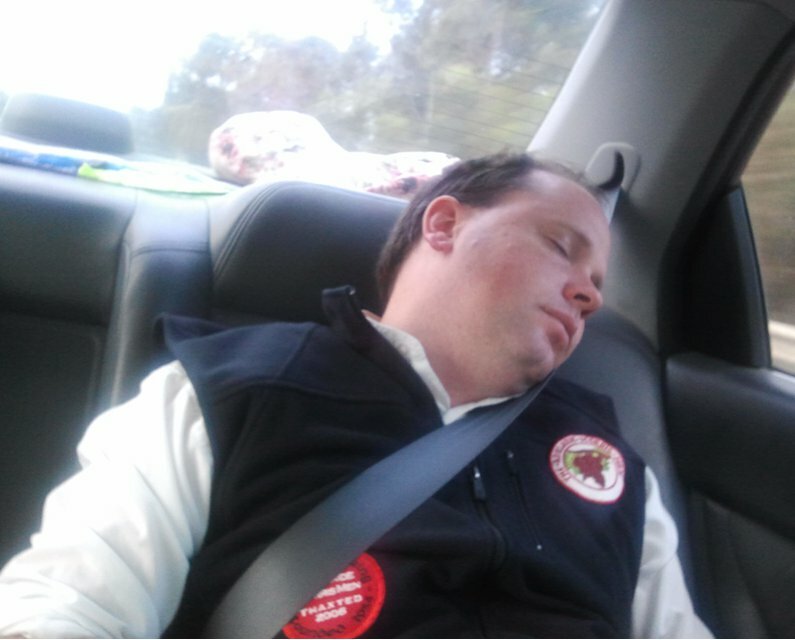 The AMM’s reluctance to prejudice their chances by refuting this interpretation found its members once again en route to Kapunda one windy moderate day called the 15th of October, 2011. Wending our way through Adelaide, plucking the varied parts of our dancing machine from suburbia, a squire here, a musician there, we received a call from Andrew, a past master of the opportunistic planning so integral to the Morris. In requesting that we rescue him from his particular marital strife of that day, he reiterated “I always rely on the kindness of strangers” and since there is little stranger than Morris we picked him up on the way through. As it turned out we fielded a force of ten dancers, of which some played, plus a dedicated muso. Kapunda, has always been the home of the Celtic Festival. This now-modest offering was, in its glory days, seen by many as one of the foremost folk functions in Oz. Whilst its popularity has dwindled the talent has not, evinced by both our observations and (blush) our presence. 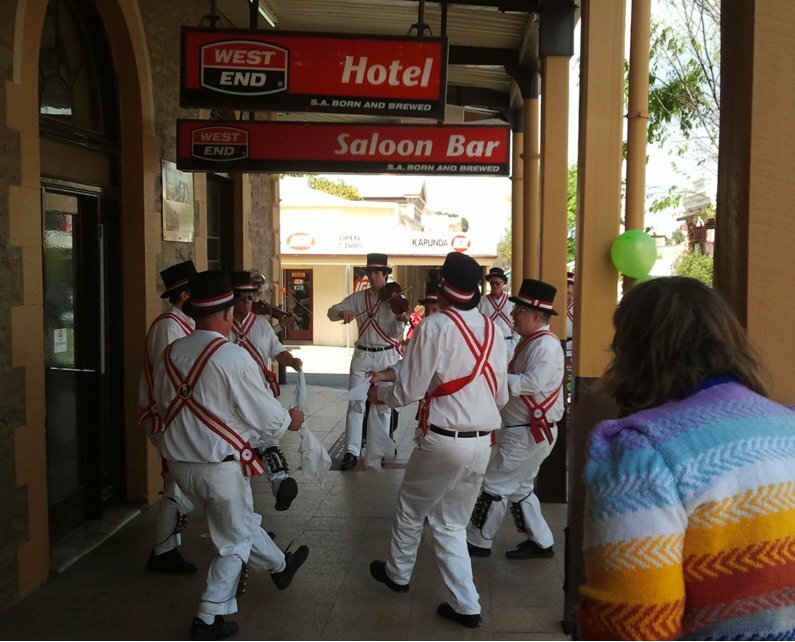 The town is renowned as the home of cattle baron Sir Sidney Kidman and , while evidence of his past influence abounds, his opinions on Morris dancing are sadly lacking. 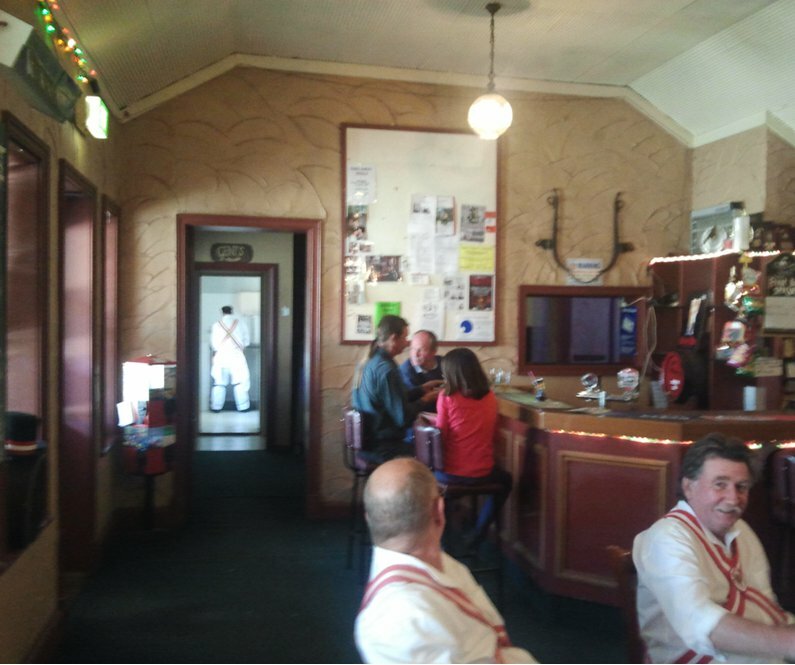 After a heart-starter in the front bar we repaired to the footpath outside the North Kapunda Hotel (see photo), cutting loose in fine form and with derring-do to announce ourselves and the festival to the steady stream of passers-by. Here we exercised the fine art of cloister capering, where strategically placed posts encourage participants to pursue ever-more-daring variants on traditional dancing lines, lending interest, and contusions, to the usual confusion. Gale force winds also provided valuable experience in horizontal hanky play for our tyros Shane and Matt (of York), as they contributed new faces, music and dynamics to the venture. Apparently this is us "cutting loose in fine form and with derring-do". We retired for a restorative and returned for another set before milling recklessly across Kapunda’s main drag and into the delights of the festival proper. Due to some inspired milling by one or two of our more experienced exponents the Morris were invited to perform in the Big Tent while the next act was setting up, the previous act having departed with muttering and murderous glances at our bells. Despite (or perhaps due to) a confusing initial counterpoint of our tunes with the continued offerings of the PA, our set of three rather confined dances was well received by an attentive audience, and it wasn’t even raining outside. Our squire then forayed out for the right venue for our next set. Some thought he had spat the dummy, taken his ball and gone home but no, with his singular waddle he returned, bearing tidings of a veritable dancing paradise. This centre of (he said) international attention, had an ( almost) level surface and was located in Kapunda. As it turned out, one out of three wasn’t bad. So, perhaps as much to prove that we do not spend the entire day around a pub, we proceeded up the main street to the squire’s much lauded location. Thus ensued a set of predominantly stick dances, now that the wind had abated. Recollections of our previous visit then took us on to the “Sir John Franklin” for a further set in their beer garden. This cultivated space of paving and furniture , once a grassy paddock of timber stumps surrounded by bouquets of fencing wire, was now the perfect venue for our purposes. We ended the day with a few barflies in the Clare Castle, a public house of questionable planning (see photo) and kero-tin décor. A case of the conveniences being a little to convenient for comfort at the Clare Castle Hotel. We performed our farewell flourish on the avenue’s edge outside the Castle to a chorus of well-meaning carhorns, the ubiquitous witticism of the touring car aficionado, before the long drive home. A drive so long in fact that oblivion claimed some long before suburbia. It was a good day.